I was quite looking forward to reading this book, assuming from the title that it would be a handbook. As it turns out, it's a textbook which means that it targets a very different audience. As a textbook, the material is not aimed at parents and aides but rather, at academia. 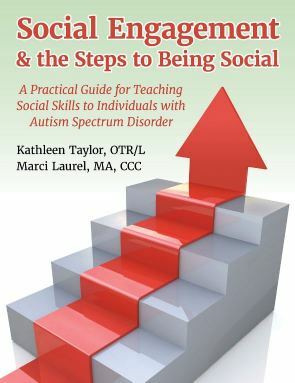 It's a well written book which covers a lot of ground in terms of establishing and improving social contact between people on the autism spectrum and others. The early chapters cover topics including the getting and retention of attention. There are also some exercises which are designed to increase attention span. These categories contain many sub-categories which move your child from noticing that they're someone else playing beside them, through to parallel play, joint attention and exchanges though to group co-operation and friendship. There's a section explaining the details of each of these in groups of four... the lower, middle and upper four. Throughout the book, there are various case studies highlighting particular techniques which have worked and in the later parts of the book, there are numerous checkboxes and surveys to help you to determine the stage that a given child is at in their social engagement. I found the book a little too academic for family use but it is certainly useful in academic circles and I expect, also with professionals,particularly in speech and occupational therapy. Social Engagement and the Steps to being Social by Kathleen Taylor and Marci Laurel is published and available from Future Horizons and is also available from Amazon and Booktopia. It appears to be only available in paperback at the moment, though there are hints that an eBook is on its way. I'd recommend it for professionals and academics. Honesty Clause: I was provided with a PDF copy of this book free of charge for review purposes. Great review. Thanks for posting it. I will purshase it.